Amanda Clayton, 25 year old mother from Detroit won $735,000 on Michigan lottery. Despite collecting her prize winnings she continues to take public assistance payments amounting to $5,475. She said, she needed help at that time. Last July 24, she was sentenced to serve nine months of probation and pay court costs and fines. She has repaid the money she received for food assistance as part of the sentence and she is currently looking for a job. George Johnson, a retired college professor from Greensboro won $250,000 in the Mega Millions Friday draw, July 20. The winning combination used by Johnson came from his wedding aniversary and family birthdays. He plans on giving his wife half of his winnings. He also plans on using the money to take care of the family and go on a cruise. Lottery fans and customers of Overseas Subscribers Agents (OSA) have more reason to be happy. OSA is now present in different social media branches, bringing you the latest updates in the lottery world – particularly on your favorite lottery games. Now, you'll be able to receive the latest news, results, and jackpot draw updates anywhere you may be and at all hours. This is a great advantage especially if you're waiting for the results of a massive rollover draw such as American Powerball or Euro Millions. We invite you to add and follow us on Twitter, Facebook, FLickr, Google Plus and Tumblr. OSA welcomes your comments and suggestions, and will gladly take in inquiries you may have on any of our promotions and lottery offerings. Frank Castillo, a seafood salesman from Surry County won $1 million on the Mega Million last Friday, July 20 draw. He plans on paying off his mortgage and auto loans, start a college funds for his children and start a business. Martha Mae Petry, 63, from Gueydan, won the top prize $100,000 on a Cash Frenzy scratch-off game. “I always buy scratch-offs. I won $10 on a scratch-off just last week, but this, this took 20 minutes for it to sink in,” said Petry. She plans on purchasing a new car. Mark Hosier of Whitewood, South Dakota won $50,000 on the Montana Lottery's "Ruby Red 7s" scratch game. He purchased his ticket at the Loaf N' Jug in Fairview. He plans to pay his bills and go on a cruise. Chris Fowler, 55 from Fort McMurray, Alta, won$21.8 million on the Lotto Max draw. Splitting the $45.5 million on the July 13 jackpot with another winner, Regina Sask. Fowler, recently divorced, buys lottery tickets regularly. He plans to retire and see the world. Also, he plans to fly home to Newfoundland and share some cash with his loved ones. "I want to travel, looks like first is Vegas," he said, "I want to take care of my family and my children's debt." Lotteries have been around for ages. This game of chance is a popular form of recreation that many people take an interest in. And why not? You simply have to choose a set of numbers that you feel are lucky enough to bring you winnings. You wait for the lottery draw and if you are truly lucky enough, your numbers just might be one of the winning numbers. It is purely a game that a lot of people enjoy. The best part is you always get a chance of winning big bucks in return. 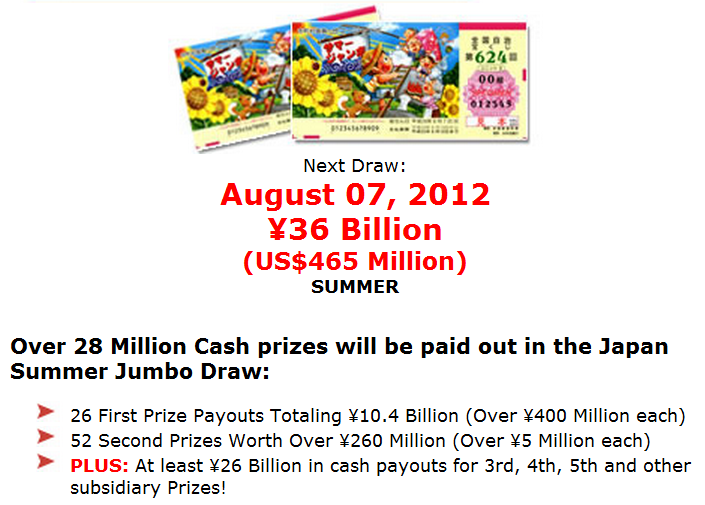 Japan Jumbo Draw is one of the most popular lotteries in the world. It is also known as the richest Asian lottery draw because of the staggering amounts of money that you can win. It is a legit and licensed lottery that is under the Japanese national government. What is special about Japan Jumbo Draw is its capacity to take in bets from all over the world. It can not only be played by the people living in Japan but also by others who are living in various countries around the globe. You simply have to purchase your lottery tickets online. What is convenient about it is that you will informed of the lottery results through e-mail. What you have to understand is that tickets for the Japan Jumbo Draw are limited so it would be best to place your bets in advance to make sure that you will be included in the draw that you want to take part of. There are four regular Japan Jumbo Draws in a year. First is the Green Draw which happens in March. Second is the Dream Draw in June. Third is the Summer Draw in August. Total winnings in these three draws can start from US$400 million to US$469 million. There is also a Year-End Draw in December which has the largest prize pool amounting to US$ 1.3 billion. 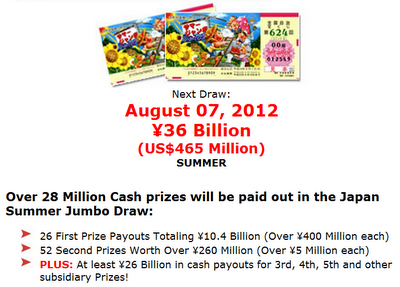 The lucky winners shall be paid in lump sum and totally free of any Japanese government taxes. The Japan Summer Jumbo Draw this coming August will be a great lottery draw to be a part of with over 28 million worth of cash prizes that will be given away. There will be 26 first prize payouts totaling to over ¥ 400 million each, 52 second prizes amounting to over ¥5 million each, and other exciting cash payouts for other prizes. Congratulations to the Winner of the USD10,000 Easy Cash Draw! The winner of the first Easy Cash Draw has been drawn as well as this month's four Year of Your Life draw winners. OSA congratulates MPF of France for winning the USD 10,000 Easy Cash Draw grand prize for 2012! There are 28 winners of the Year of Your Life Draw so far and any one of our existing players or new subscribers can join in and win. To qualify for the monthly Year of Your Life Draw, you must either be a new player or a renewing player during the prize draw month. Every lottery subscription gives you an entry in the raffle. So the more lotteries you play, the more chances you have to become one of the month's raffle winners. Entries into the Easy Cash Draw, on the other hand, are earned with every purchase you make, whether by telephone, email, website or direct mail. Confirmation of your Easy Cash Draw entries will be included in the Official Entry Confirmation sent to you for your subscriptions. So keep playing your favorite lottery draws for chances to win multi-million dollar jackpots and an extra $10,000 in the Easy Cash Draw! Judy Chambers, 62 year old from Lindale won $377,777 in Georgia Lottery ticket. She is planning to spend the money on her grandchildren and and buy a place on the lake for her great-grandchildren. Heather Needham, from Norfolk, matched correctly all five winning numbers in the July 6 draw of Virginia Lottery's Cash 5 game. She used Easy Pick where you let the computer to randomly select your numbers. She was given 2-12-16-19-27 which won her the top prize of $100,000. Noel Peel and wife Fredda, from Seymour, won $60 Million in the Powerball Lottery draw on June 23. The winning numbers were 1-3-41-44-53 and a Powerball of 30. "We just couldn't believe it," Peel said. They plan on saving the money for their children's education, give some to charity, but first they need to fix their roof and get the wife a new car. This lucky man from Johnston, just claimed last Monday his winnings of $30,000 on an instant ticket. Two months ago, he won $10,000 in a different instant game. He says he is not sure where his luck is coming from. He is planning to put the money in the bank just like his first winnings. Workers from Quaker Oats Cedar Rapids plant, won the Powerball jackpot of $231 Million last June 20. It is Iowa's biggest lottery prize payout. The group did not want to give their names, so they were given 10 business days to request an injunction which the group failed to do. A total of 18 men and 2 women, they are : Tommy Campbell Sr., William Carnahan, Mike Hughes, Denise Hunt, Terry Koopman, David Morgan, Charles Shedek, Gregory Stearns and Rodney Tierney from Cedar Rapids; Timothy Himmelsbach and Kelly Mulford from Marion; Daniel Cantonwine of Vinton; Kenneth Cole of Fairfax; Robert Havlik of Toddville; Carol Kremer of Central City; Allen Miller of Shellsburg; Larry Nielsen of Walker; Brent Novak of Shellsburg; Jason Rauch of Ryan; John Wharton of Keystone. The group opted to receive their prize in a lump sum of $160.3 Million. Each one received $8 Million. 11 of them said, that they will retire after getting their prize winnings. Tommy Arviso from Antioch, won $250,000 on a California Lottery Black Scratchers ticket last Saturday. He thought that he had won only $25 and was not really impressed with the amount. It was only when a family member was about to throw the ticket when he double checked and found that he won the top prize. Arviso told lottery officials the money could not have come at a better time. He plans on using the money to take care of his family, invest in his home, and upgrade his Fender bass guitar. A group of Zellers workers at Brentwood Mall won $1 Million LOTTO MAX jackpot last June 15. "There has been plenty of high fiving and celebration at the store lately," says group trustee Doris Knoll. "This is such good news. We had been told a couple of months ago that our store would be closing next March." The group, consists of 24 person will receive $41,666.67 each. "Yes, we are all going to keep working," added Knoll. "And yes, we have already bought our tickets for this weeks' draw."